This dream catcher features a cosmic spiral weave pattern and uses your choice of natural stones in the web (shown with Amethyst). Hand crafted in the USA. The hoop is wrapped with deerskin in your choice of colors (shown in black), and it has 10 long leather streamers which are decorated with glass crow beads and your choice of feathers (shown with Ringneck Phesant, Brown with Black Spots). 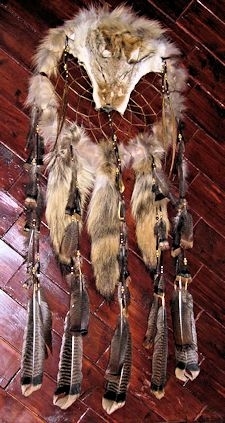 This dreamcatcher is pictured in the 12" hoop size. The larger the hoop, the more pronounced the spiral pattern will be. 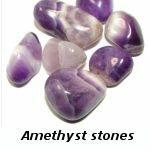 Bead colors on the streamers will be chosen to compliment your choice of leather and stone colors, or you can leave a comment in the comment box on your order form if you would like specific colors for the beads.